The Task option allows you to select what the schedule will run to obtain the report to be distributed and for WebFOCUS procedures (FEXs), such as whether or not to burst the report. In the Advanced Scheduling tool, you can set multiple tasks for the Email and Printer distribution methods. For more information, see About Tasks in the Basic Scheduling Tool. Note: Tasks available in the Advanced Scheduling tool depend upon the privileges granted to the user. Changes to privileges are reflected in the Advanced Scheduling tool after the cached security policy clears. 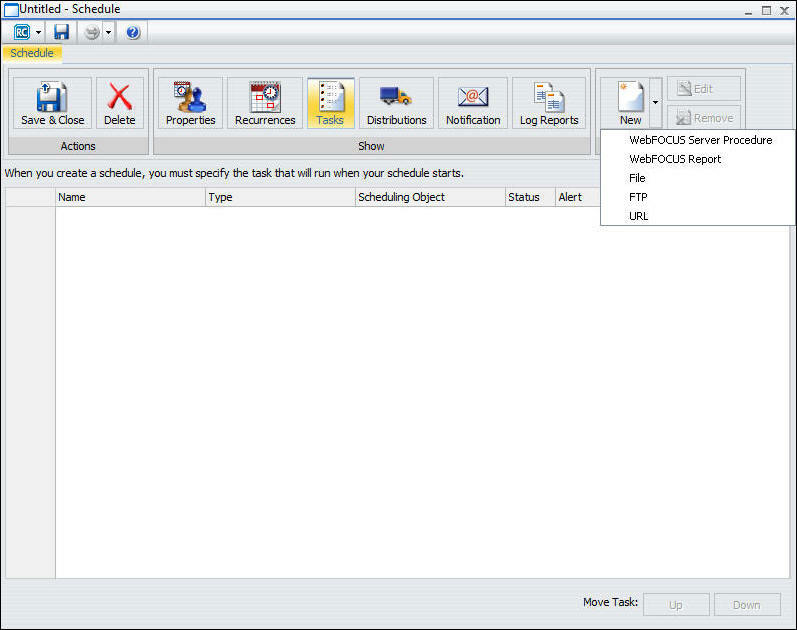 The following image shows the Task tab in the Advanced Scheduling tool when you click the New drop-down list. To create a Task, if applicable, verify the Path, Procedure, Server Name, Execution ID, and Password. For Report Properties, indicate if you want to burst the report (FEX) output. Optionally, select the Override the Format Specified in the Procedure check box to override the format specified in the procedure with a selection from the drop-down list. The following image shows the Task dialog box for a WebFOCUS Report task. You can also use parameters when populating certain fields in this dialog box, as shown in the following image. You can use parameters (amper variables) when specifying a value in the Save Report As field of a schedule. These parameters can be system variables, such as &YYMD or any amper variable for which a value is returned by the Reporting Server when the scheduled procedure is executed. To use the dot file extension separator after a variable terminate the variable with the '|' character, for example, &YYMD|.htm. Similarly, to use the ampersand character itself, follow the ampersand with the '|' character (for example, Smith&|Jones). If a value for a parameter specified in a schedule is not returned by the Reporting Server when the procedure executes, the schedule will fail with a "No report to distribute" error. If the scheduled task is burst, you can also use the '%BURST' symbol to include the burst value in the Save Report As field. 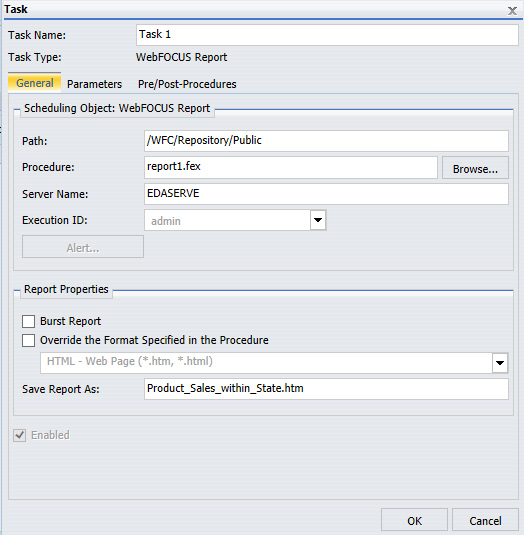 The WebFOCUS Client Universal Profile is executed by ReportCaster when a WebFOCUS Repository procedure is run, but not when a WebFOCUS Reporting Server procedure is run. For more information, see the WebFOCUS Security and Administration manual. The Task dialog box for a WebFOCUS Report and a WebFOCUS Server Report displays three tabs. General tab. Specifies the Path, Procedure, Server Name, Execution ID and Password. Also allows you to specify Report Properties, including the option to burst the report (FEX) output format. Optionally, select the Override the Format Specified in the Procedure check box to override the format specified in the procedure with a selection from the drop-down list. For more information about selecting a report format, see Selecting a Report Format. Note: If the scheduled report is a compound report that uses the stabilized SET COMPOUND OPEN syntax, you must select the Override the Format Specified in the Procedure check box and specify the format in the schedule when scheduling this report. Otherwise, the report will not be distributed. 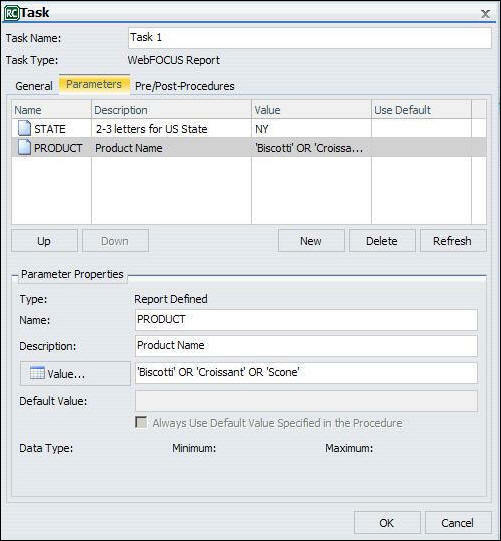 Compound reports produced by the WebFOCUS and App Studio reporting tools (for example, InfoAssist+ and Document canvas) do not require that the Override the Format Specified in the Procedure check box be checked. Parameters tab. Specifies values for parameters that are required at run time by the report procedure (FEX) being scheduled. The following image shows the Parameters tab selected and two parameters, STATE and PRODUCT, with values selected that will be saved for the schedule. The functionality within the Advanced Scheduling tool Task Parameters tab is the same as the Basic Scheduling tool Parameters option that displays in the Task Parameters dialog box. For more information about creating new parameters or specifying parameter values for a simple, static list, or a dynamic list parameter that allows single or multiple values, see Specifying Parameter Values. For more information about creating a new parameter, see Creating a New Parameter. For more information about deleting a parameter, see Deleting a Parameter. Pre/Post-Procedures tab. 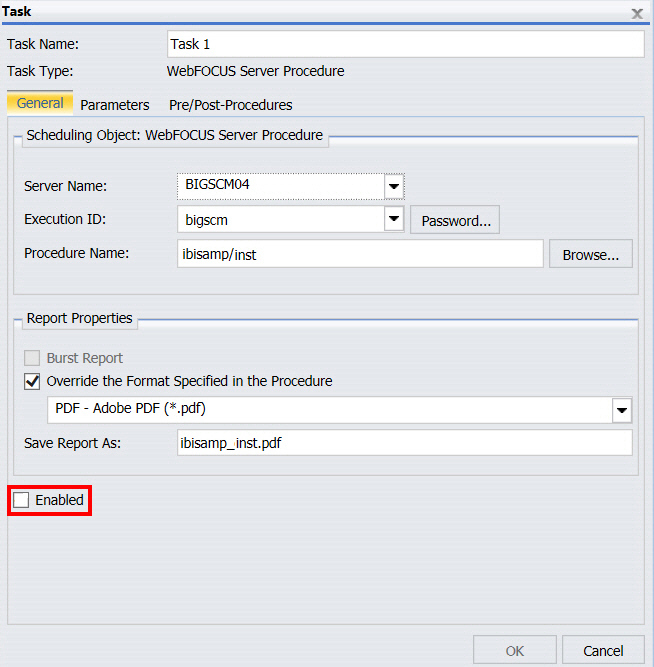 Allows you to specify that a WebFOCUS Server Procedure should be run before or after the scheduled task is run. For more information about using the Pre/Post-Procedures tab, see Schedule Pre-Processing and Post-Processing Procedures. When working with an established schedule, you can disable one or more tasks within that schedule. You can also create a new schedule with multiple tasks and then disable one or more of those tasks, as needed. For more information, see How to Create a Schedule in the Advanced Scheduling Tool. Note: This procedure applies to schedules that have multiple tasks. If you disable all tasks in a schedule, the schedule is disabled. Using the Advanced Scheduling tool, create or open a schedule with multiple tasks. On the ribbon, in the Show group, click Tasks. If you are creating a schedule with new tasks, click New. For more information, see About Tasks in the Advanced Scheduling Tool. If you are editing an existing schedule that already has multiple tasks defined, select a task from the list and click Edit. In the Task dialog box, clear the Enabled check box, as shown in the following image.